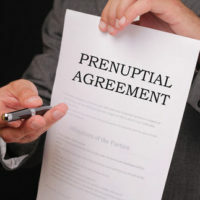 In many television shows and movies, a prenuptial agreement (also known as a “prenup”) is often presented in a negative context. The premise is usually a scorned spouse who is left with nothing because they agreed to sign a prenup. Like many legal issues adapted to Hollywood drama, reality is far different. Prenups can be good or bad, depending on the terms of the agreement. It is important to remember that marriage is a contract between two consenting adults involving financial rights and obligations. A prenuptial agreement can help a couple further define and clarify those rights and obligations. A prenuptial agreement can also help clarify financial responsibilities during the course of the marriage. For example, it can stipulate which spouse is responsible for filing of taxes, paying household expenses, pay education costs, and so forth. If you are previously divorced and have children, you may have support obligations. A prenuptial agreement can help protect your assets for the children in the case of a death or divorce. If you are the owner of a business and you wind up getting divorced, there is a chance that your spouse may attempt to claim partial ownership. A prenup can help establish a clear distinction between marital assets and business assets. If you decide to leave the workforce and raise children, you are obviously giving up current income and hindering potential future earnings. A prenup can ensure that the financial cost of raising children is shared equitably by both parents and that the parent who gives up working will receive financial support if the marriage ends. If you are eligible to receive, or currently own, precious family heirlooms and other property, a prenuptial agreement can make sure that these items remain with your family in case of death or divorce. If your spouse has a large debt load from student loans and/or consumer debt (e.g., credit cards), a prenuptial agreement can protect you and the community property from those debts. For example, a prenup can stipulate that the community property from the marriage cannot be seized or liquidated due to failure to service debt brought into the marriage by your spouse. As you can see, the reason a prenup can actually be beneficial for a marriage is the fact that it forces you and your spouse to communicate about finances and how you want to spend your lives together. The Houston family law lawyers of Lindamood & Robinson, P.C. possess over three decades of litigation and mediation experience. We work tirelessly to represent your best interests in an effective and cost-efficient manner. Contact our office today to learn more.